Luckily I have a chance to participate in Gueorgui Pinkhassov’s workshop in Tokyo 2015. The following Q&A is a reminder before the workshop begins. Our meeting is coming up next week, but because our workshop is relatively short, I want you to be well prepared so I am going to give you some instructions. Nothing is more valuable in the modern world than novelty. Most of our exercise will focus on searching of new forms. The main goal here is to be ready for the unexpected and be able to react, so our technical means should be convenient, simple and most important of all fast. I recommend a digital SLR which is a Canon or Nikon with one zoom lens, or an iPhone. Compact cameras FujiFilm or Olympus are ok too. I place my camera on the automatic mode (p-mode) and only change the exposure compensation when shooting. It’s true you can make a mistake and take the picture the wrong way. But, who really knows what’s the wrong way is? So, to some extent, making mistake will be part of our goal. 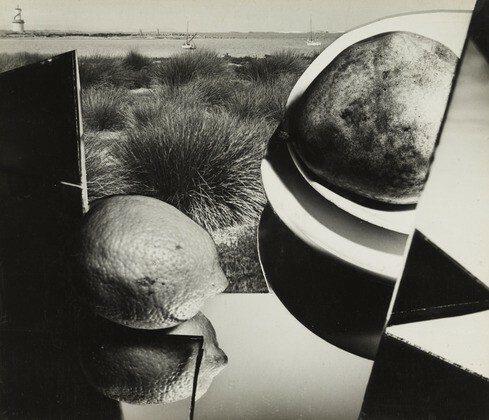 There is an exhibition in Paris right now of Florence Henri’s photographs called “Mirroire des Avant-Gardes” 1927–1940. She is one of the first people who began to experimenting with form. Look at what she was able to achieve, I will try to offer a few shots from the exhibition as examples. And in general treat shooting as a game, try to turn everything into form. Let it be simple exercises but don’t aspire to be in masterpieces, but no one really knows what might happen. Here in this group you can share your findings, ask questions and answer them, and share everything that you think might be interesting to us. Is it important to have a concept or idea while before/after shooting? The reason I ask this question is because I was often being questioned “what does this picture means?”, “what do you want to represent?”, and my answer is always “that leaves the viewer to find out”, which seems to be disappointing for the viewers. I find the current art world overly appreciate those ideas that can be verbalised, but not those can’t be verbalised. how do you connect single pictures into a larger project (book, exhibition, etc)? It’s a very interesting topic and later I’ll try to expound my opinion. But today it’s important for us to be engaged in another thing. No ideas — just reflexes. And it’s not even shooting, but fishing. And then, from the catch you will lay out your “Dutch” still life. It is your concept. The process should not be started with a concept, but finished with it. It will appear unexpectedly as well as a photograph itself. An assignment is just a pretext, preliminary area where you will start from. But as soon as you start, you must forget everything. You can go unnecessary or wrong direction and discover the things you haven’t even guessed at. But don’t worry, I won’t give you any assignments. My experience shows that the more irresponsible you think about it, the better the result will be. During my workshop the first goal is to forget all those prejudices, and above all — to relax. The next goal is to abstract your mind from any concepts or subjects and to learn to understand visual harmony and feel geometry. It’s not work, but game — “to transform everything into form”. And it’s very important to remember that we must take much more photos and throw out even more photos. Usually we take 10 photos and throw out just a couple of them. But the result is much more effective if we take 100 photos and throw out 99 of them.